Anti-aging skin care is serious business. Many companies charge exorbitant prices promising solutions to the smallest wrinkles. Derma E offers a more affordable line with excellent natural ingredients that is also 100% vegan. 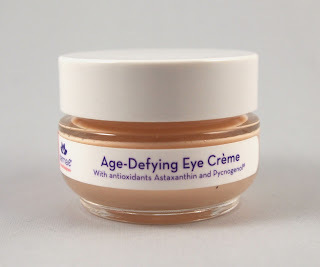 Read on for a review of their Age-Defying Eye Creme. Derma E Age-Defying Eye Creme had a gentle firming effect on my eye area. I did not see a large improvement on my under-eye circles, but I definitely saw an improvement in overall skin texture. I love the light texture, which makes this a versatile cream to be used morning and night. I'd recommend this for anyone looking for a solid anti-aging cream that is vegan, gluten-free, and uses gentle ingredients. The current price of $22.50 and modest amount required per use makes this a safe bet for almost any budget.